Terrorists who dubbed themselves the Three Musketeers have been jailed for life, for a minimum of 20 years, for plotting a Lee Rigby-style attack with large knives and a bomb. The gang, from the West Midlands, sought out infamous Islamic State supporter Anjem Choudary before they prepared to strike police and military targets on British soil. They were arrested in August last year after MI5 went to bug the car of Naweed Ali, only to uncover a pipe bomb and meat cleaver hidden in a JD Sports bag. Convicted terrorists Ali, 29, Khobaib Hussain, 25, and Mohibur Rahman, 33, who served time together behind bars, denied preparing an attack. They claimed the incriminating evidence was planted by undercover police officer Vincent, the boss of a fake firm called Hero Couriers. Vincent was cross-examined over 12 days and repeatedly rejected the allegations against him. He also described them in a private message as “the usual bollox”. Jurors at the Old Bailey agreed with him and, after deliberating for more than 22 hours, unanimously convicted the men of preparing terrorist acts. Late recruit Tahir Aziz, 38, who was found with a large sword stashed in his car, was also found guilty. Ali, Hussain, and Rahman refused to leave Belmarsh Prison to attend the sentencing hearing. Prosecutor Bill Emlyn Jones told the court that the defendants, who were influenced by the lorry attack in Nice in the south of France, were probably planning to use their cars as weapons as well as the knives and pipe bomb, which was partially complete. Ali, Rahman and Hussain were told to served a minimum term of 20 years for their “significant role” in the planned attack. Aziz was given a minimum term of 15 years for his lesser part. Mr Justice Globe noted that the four-and-a-half-month trial came amid four separate attacks in Britain. 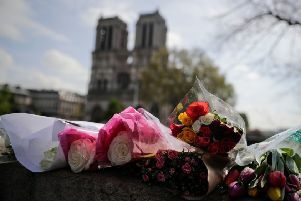 He said: “These attacks demonstrate in stark form the carnage that can be created by different types of terrorist attack that can be carried out with a vehicle, explosives and loaded weapons.